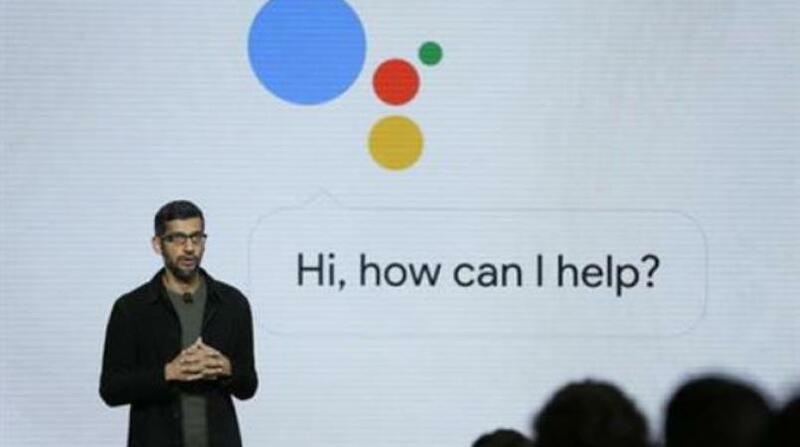 Google launched an aggressive challenge to consumer electronics giants like Apple and Samsung on Tuesday, introducing a new line of smartphones called Pixel and other gadgets designed to showcase a digital helper the company calls "Google Assistant." The new devices represent a big push by Google to make and sell its own hardware, instead of largely just supplying software for other manufacturers. At a starting price of roughly $650, the new Pixel phones are aimed at the same markets as Apple's iPhone and Samsung's Galaxy flagship phones. During a press event Tuesday, Google executives showed off a series of gadgets in rapid succession. Its new Home device is a sleek internet-connected speaker that's designed to respond to voice commands, like Amazon's popular Echo. A new virtual reality headset called Daydream View will work with the new Pixel phones and other devices based on Google's Android software. The company also unveiled a new Wi-Fi router and an update to the company's Chromecast streaming media device. In announcing the new Pixel phones, Google executives touted features like a powerful camera, a long-lasting battery — and a dedicated headphone jack, which Apple recently eliminated from its latest iPhones. The Pixel phones will be sold in two screen sizes — 5 inches and 5.5 inches — and three colors: black, silver and blue. But they're clearly hoping the new Pixel phones and other devices will be distinguished by their use of Google's software. A central element of all the new gadgets is the Google Assistant, which uses artificial intelligence to deliver what CEO Sundar Pichai described as "a personal Google for each and every user." Pichai said the company's goal is to let customers interact "naturally and seamlessly" with artificial intelligence through devices like the Home device and their smartphone. Still, while Google showed its new Assistant performing a variety of impressive tasks, analyst Patrick Moorhead of Moor Insights & Strategy cautioned that similar services, which include Apple's Siri and Microsoft's Cortana, don't always live up to their early promises. On the other hand, Moorhead said in an email that Google was smart to emphasize the performance of the new smartphone cameras, since "consumers care about this a lot." But he said other features in the new phones didn't seem that much different from what Samsung and Apple have offered in their latest devices. The products announced Tuesday also underscore Google's hope that its products and services will work better if the company designs its own hardware and software together — something Apple has long done. That's also a model that Microsoft has begun following, with its own brand of Surface tablets and laptop computers that use Microsoft's Windows software. But analysts warned that Google runs the risk of alienating partners like Samsung, LG and other companies that sell competing Android gadgets. Android now powers the majority of smartphones sold around the world. But Samsung, the biggest maker of Android phones, has increasingly been adding more of its own software — even its own Samsung Pay mobile wallet — on the phones it sells. Another big rival, Apple, has built its own services, such as online maps and its own Siri personal assistant, to replace Google's apps on the iPhone. Google, which is best known for its widely used internet search engine, makes most of its money from online software and digital ads. But it's putting more emphasis on hardware as it competes for consumers' attention with other leading tech firms. In recent years, Google has sold smartphones and tablets under the Nexus brand, which it launched in 2010 as a way to show off the best features of its Android software. But it put relatively little effort into promoting those devices, which have mostly ended up in the hands of Google purists. The new Pixel phones will be sold online, through retail chains like Best Buy and various wireless carriers around the world, although the company said it has an exclusive deal with Verizon in the United States. Like the Pixel phones, the Home device uses the digital Google Assistant service, a voice-activated personal butler that can search the internet, play music or perform other useful tasks. Google Assistant is the company's answer to similar concierge services from rivals, including Siri, Amazon's Alexa and Microsoft's Cortana. Google said the Home device will sell for roughly $130 online and at electronics retailers starting next month. Along with answering questions and playing music, the device can be used to control streaming video through Google's Chromecast device, at voice command. Home-based systems like the Echo are taking on more importance as voice technology has improved, said analyst Julie Ask of Forrester Research. "You can't assume somebody is going to go sit down at a computer or pick up a phone and type in a question anymore," she said. FEATURED IMAGE CAPTION: Google CEO Sundar Pichai talks about the new Google Assistant during a product event on Tuesday, October 4, 2016 in San Francisco. Google launched an aggressive challenge to Apple and Samsung, introducing its own new line of smartphones called Pixel, which are designed to showcase a digital helper the company calls "Google Assistant." The new phones represents a big new push by Google to sell its own consumer devices, instead of largely just supplying software for other manufacturers.